My mother loved cooking desserts, probably, I guess, because she received so many standing ovations. The earlier courses were just food for fuel, but desserts were a different matter. And the most consistent winner was probably the simplest—stewed fruit, usually apples, or blackcurrants during Christmas, topped by a buttery cake. She called it a sponge, the Americans call it a cobbler. Delicious, firm cake on top, bursting through to a bubbling, richly flavoured chunky mess of fruit underneath. Doused with cream or ice cream, it made for a wonderful finale. Not surprisingly, in a big family, there was never any left for tomorrow. My favourite of all those we gobbled down would be blackcurrants, but they have such a short and glorious season. Blackcurrants, raspberries, gooseberries and blueberries are particularly appropriate for this sort of pudding without a base; when cooked in a pastry case, they give out a tremendous amount of juice, affecting the crispness of the pastry. With the batter on top, that succulent mix of berries, juice and sugar will mostly sit at the bottom of the bowl, with some bubbling into the batter. With summer approaching, any of the great summer fruits works brilliantly—we used plums and peaches, but there are no rules: toss any or all of them in together. And, although it’s unlikely to last until the next day in a big family, it’s just as wonderful re-heated the next day, with cold yoghurt replacing the ice cream. Making a pound cake, by hand, as my mother did, required patience and stamina and lots of bowls. The Thermomix does it all in a jiffy. 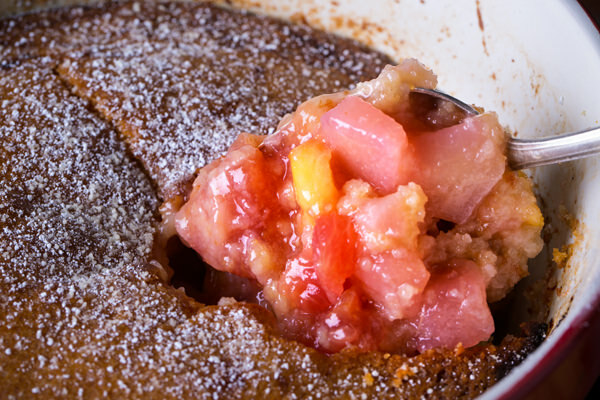 Just spoon that easily done pound cake mix—which will have the consistency of lava—atop the stewed fruit and whack it in the oven. You can see the recipe, a sneak preview of what’s to come in our next issue, here.